Various pages on three-dimensional solids. 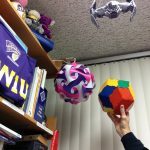 Here are a few ideas for undergraduate research projects involving three-dimensional geometry. Understanding dihedral angles. How to measure them from all the ways the angle may be presented. 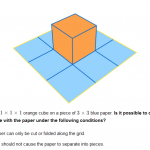 How points lines and planes are represented in 3 dimensions. Szilassi polyhedron – http://www.thingiverse.com/thing:12200 http://themathkid.tumblr.com/post/153564454406/57crazylittlethings-twocubes-apparently other coloring results in 3-dimensions.